The article will start with an examination of the Green Mountain Davy Crockett grill, followed by more detailed specifications. There is a breakdown of product advantages and potential issues that end in a list of Pros and Cons. The article concludes with a discussion of issues and solutions found in online customer reviews. There are many options available to those who enjoy grilled meats, and the Green Mountain Davy Crockett provides many options in one portable unit. This article will review this wood pellet grill, highlighting its grilling features. A high-level temperature control and remote capabilities are showcased with this product. This Davy Crockett version is a pellet style grill. Wood pellets are used as fuel to provide flavor as well as heat for grilled meats. A lighter weight and compact design make this grill highly portable when compared to other grills of similar design. Multiple adaptors allow this unit to draw power from household style outlets or vehicle power sources. This grill makes use of a primary burner that produces heat up to 550 degrees Fahrenheit. A 12 x 18-inch cooking surface is capable of generating even heat for a well-cooked meal with no cool spots. To remain in control of your cooking, you can monitor the temperature digitally through a screen. On top of that, WiFi technology provides remote grill control through a user’s phone. This grill should provide plenty of cooking power for small groups and family activities. The portability and power source options make this grill a great option for boaters, campers, hunters, and sports fans who are looking for a grill to use while tailgating. Portability: The stand-out feature of the Green Mountain Davy Crockett shows how easy it is to transport. It is lightweight for a pellet style grill and can be easily moved by two people. This grill is equipped with foldable legs that provide a smaller footprint for storage. Remote Capabilities: Its remote technology is also worth paying attention to. This technology allows a user to control the grill with their phone while they do other things. As a result, the user will not be forced to stand at the grill or make frequent check-ins. Temperatures can be set accurately while the constant remote monitoring can double as a safety feature as well. Power Options: This grill can be plugged into a 110 Volts outlet. That feature allows it to be used at home or on the road with a generator. It is also possible to power the grill with a 12 Volts plug. This extra adaptor option should make the grill easier to use while boating, camping or tailgating. Company Support: Green Mountain provides customers with online support that includes email, FAQ product page, and an online manual. They also provide phone support as well as a two-year warranty on their Davy Crockett model. Things to Keep in Mind: The foldable legs allow this grill to pack up nicely. Their design also makes the Green Mountain Davy Crockett a bit too heavy. Its legs are also designed to act as carrying handles. This design element appears as limited when setting the grill up. That’s because the product would benefit greatly from a second handle. Finally, keep in mind that the leg joints may wear over time as long as there is extended use. The Green Mountain Davy Crockett is portable. This product is equipped with WiFi control technology. It can run on either 12 volts or 120 AC. The company offers extra accessories designed specifically for this grill. 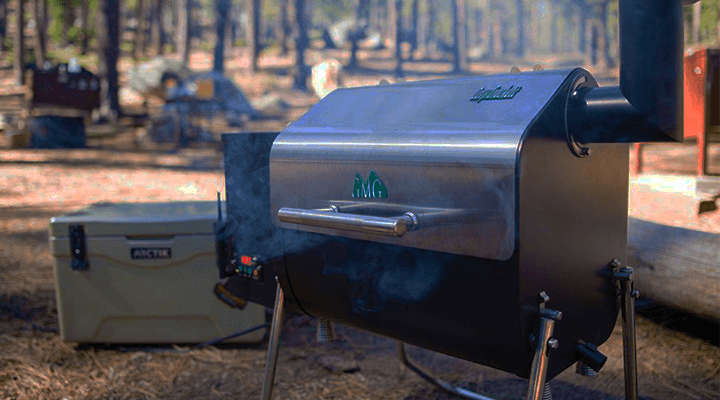 The design of the Green Mountain Davy Crockett makes the grill top-heavy. It has foldable legs that present a potential weak point of the grill’s construction. The lack of a second carry handle makes the product more difficult to carry. A few reviews highlight difficulty with assembly. Some customers found the grill difficult to set up before use. There were users who expressed concerns with the meat probe. A couple of reviewers highlighted smoke coming from the hopper. There were comments that described the instructions as vague. Most customers expressed little or no issue with product assembly. On top of that, they found the online resources for this model as extremely helpful. Others mentioned that the grill was hard to set up before grilling. Users have suggested that practice with the setup and breaking down before using the grill can help with this. Moving on, issues with the accuracy of the meat probe were countered with reviews that felt it read temperatures correctly. Moreover, purchasing a third party probe can solve any reading problem people may notice. Smoke build-up shouldn’t be an issue as long as grill owners employ the vent system properly. The Green Mountain Davy Crockett may prove ideal for those looking for wood-flavored grilling and portability. Digital control and remote input provide a modern grilling experience. We’d love to hear about your experiences with this grill as well as your tips for getting the most out of it! I think my friend has this model. The built in WIFI technology is a really cool feature. Not sure how much I’d use it, but the grill itself would be good for family outings. I can see this out by our cabin. Hey, Jamie, thanks for your feedback. Since this Green Mountain grill seems ideal for your friend, lets find the one for you too. Like our Barbecue Grills Expert Facebook page to get fresh barbecue reviews right in your news feed.